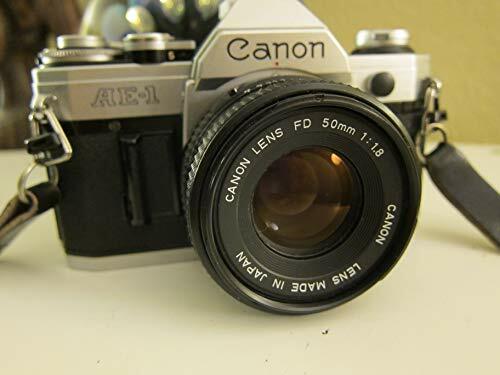 The Canon AE-1 Program is a 35 mm single-lens reflex camera that uses Canon's FD mount lenses. 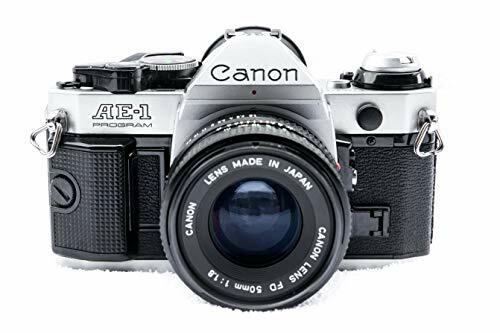 It was introduced in 1981 as the successor to the Canon AE-1, five years after that camera's introduction. The major difference was the addition of the Program AE mode first seen in the A-1. This mode sets both the shutter speed and aperture automatically, albeit with a slight bias towards the shutter speed setting. The user focuses the camera and then presses the shutter button. For those desiring more control, the AE-1's shutter priority auto-exposure and full manual modes are still available. 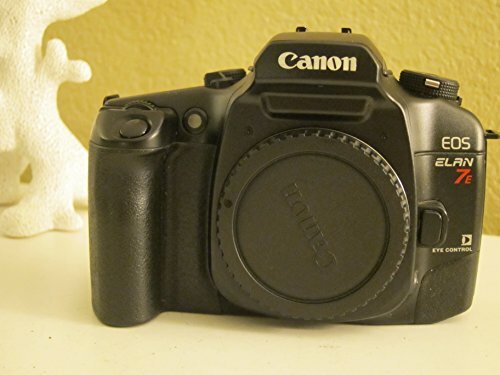 The Canon EOS Rebel 2000 is an affordable, lightweight, andfull-featured automatic 35mm SLR for both beginning and advancedamateur photographers. It offers a host of special modes for specificshooting situations, including full auto, manual, night scene,portrait, landscape, and more. It also has shutter-speed priority andaperture priority modes--although most users will inevitably leave thecamera in full auto mode a majority of the time and the cameraperforms very well that way. Just remember that the empty rectanglesymbol on the mode dial is for full auto. Some other basic features include an impressive seven-point autofocussystem, LCD panel with extensive information display, three exposuremetering modes (evaluative, partial, and centerweighted), autoexposure bracketing, a multiple exposure function, and depth-of-fieldpreview. The autofocus system is incredibly responsive, and includesseven focusing points that can be set individually for super creativeshooting. In other words, using the LCD panel as a guide, you can setthe camera to automatically focus on the far right focus point (or anyof the other points) so your main subject doesn't have to be in themiddle of the frame to be in focus in a snap. In fact, most settings can be adjusted in creative ways on the Rebel2000, like the exposure level, which can be set to overexpose orunderexpose up to two full stops for tricky lighting situations whereyou might want to fool the camera's metering system. It also has asmall, built-in pop-up flash, plus a hot shoe for an additional flashunit. Overall, we found this camera to be smartly designed with anattractive look and a comfortable feel. 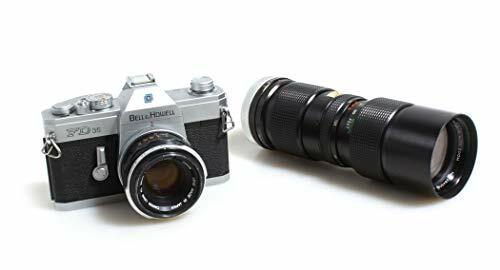 The K1000 is an almost-all metal, mechanically (springs, gears, levers) controlled, manual-focus SLR with manual-exposure control. It is completely operable without batteries. Batteries are only required (one A76 or S76, or LR44 or SR44) for the light metering information system. This consists of a centre-the-needle exposure control system using a galvanometer needle pointer moving between vertically arranged +/- over/underexposure markers at the right side of the viewfinder to indicate the readings of the built-in full-scene averaging, cadmium sulfide (CdS)battery light meter versus the actual camera settings. The meter does not have a true on/off switch and the lens cap must be attached to the lens to prevent draining the K1000's battery when it is not in use. The K1000 uses a horizontal travel, rubberized silk cloth focal plane shutter with a speed range of 1/1000 second to 1 second, along with Bulb and a flash X-sync of 1/60 second. It is 91.4 millimetres tall, 143 mm wide, and 48 mm deep, and weighs 620 grams. The body is finished in black leather with chrome trim only, although early production Pentax K1000 SE bodies have brown leather with chrome trim. 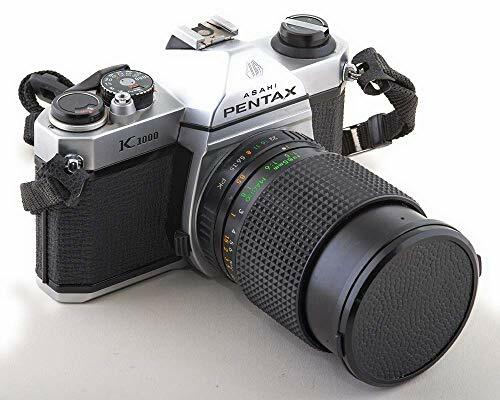 In 1983, a K1000 with SMC Pentax-M 50 mm f/2 lens listed for $220. 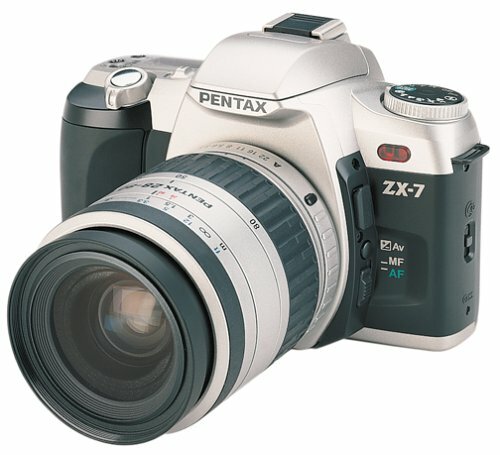 Pentax's new ZX-7 offers compact size, solid performance, ease of use, and impressive capability. The ZX-7 offers the photographer both auto and manual focus. The camera has three autofocus (AF) points for sensing the subject and will automatically switch to predictive AF mode if it detects subject movement. The AF system is focus priority, so the shutter is locked until the camera focuses on something, virtually guaranteeing that you won't shoot a picture that isn't focused. If you prefer to use the manual focus setting, the AF status light will glow when you have achieved correct focus. The built-in flash uses spotbeam technology, which assists the AF system when focusing in dim-light situations. The system is capable of assisting the AF down to light levels of the current standard for assist technology. The ZX-7 also offers a snap-in mode, which only functions with non-AF lenses. The camera will fire when your subject enters the range you have chosen and is in focus. This feature is perfect for an action subject, such as horse racing. You can choose a proper background and take the picture when your subject passes a specific point. The Pentax ZX-7 comes with a built-in TTL exposure meter that breaks the image into six zones. Linked to the AF system, ISO settings range from 25 to 5,000 and are set automatically via DX coding. Manually, you can set ISOs from 6 to 6,400. In addition to auto mode, the ZX-7 offers the photographer programmable AE, portrait, landscape, action, close-up, and night modes. The built-in TTL flash unit covers a field of view equal to a 28mm lens and is capable of daylight sync, slow sync, and red-eye reduction. Maximum flash sync is 1/100 second. The camera allows for shutter speeds from 30 to 1/2,000 seconds. The built-in motor drive is capable of up to two frames per second and has a self-timer with 12-second delay. Quartz dating allows you to document your photographic memories. The Pentax ZX-7 is a solid camera with a full load of advanced automatic features for those individuals making the transition from point-and-shoot to 35mm SLR technology. 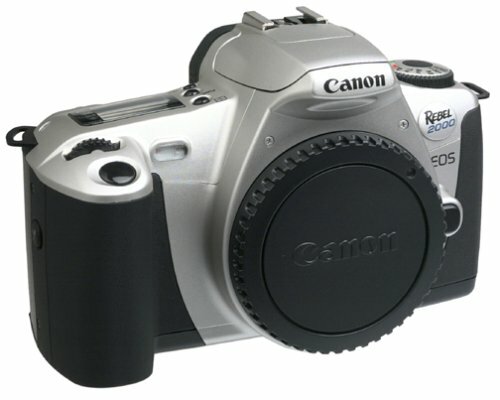 The Canon EOS Rebel 2000 is an elegant camera body with 35-zone automatic exposure. It has a retractable flash and 11 versatile shooting modes. It's small, light, and supports advanced flash-metering system features including E-TTL, FE lock, and high-speed synch modes with EX-series Speedlites. It has a full range of features, including remote control socket, depth-of-field preview, and scale-metered manual exposure. Creative controls include a seven- point autofocus system, 35-zone AE metering, programmable portrait, landscape, close-up, sports, and night scene modes. Advanced features include a choice of evaluative or partial metering patterns, AE lock, auto exposure bracketing, multiple exposure, and more. The EOS Rebel 2000 is fully compatible with all EF lenses and EOS Speedlites, including Canon's latest EX series with E-TTL, FE lock, and high-speed synch modes, for incredible flexibility in creative flash photography. 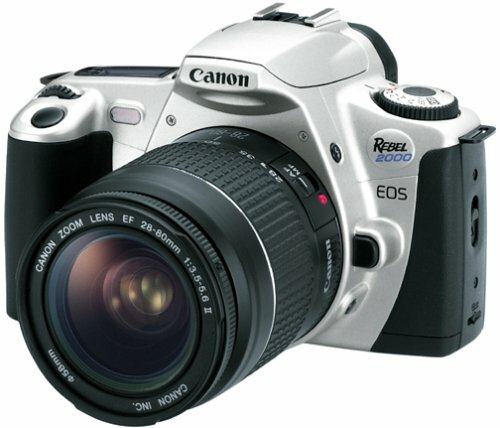 With easy-to-understand key controls and command dial, the Canon EOS Elan IIe offers advanced SLR features. It has automatic exposure control for any light conditions and a built-in flash that lets you shoot indoors or out, day or night. 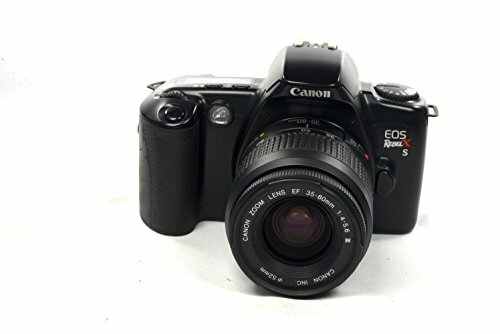 The Canon EOS Elan IIe is fully automatic, but lets you control the essentials manually. It offers nine different programmable exposures and a 10- second-delay self-timer. It is slightly different than the EOS Elan II in that it features eye-controlled focus. This allows the user to control the point of focus by looking at specific parts of the image; an on-board sensor follows eye movement and the lens automatically changes focus as the eye moves to points within the frame. This model features an LCD screen showing exposure information and LED readouts showing custom functions. The viewfinder provides all the information you need to set up your shots, including depth of field, flash, shutter speed and aperture, and much more. The EOS Elan IIe allows for film speeds from ISO 25 to 5,000. The speed is set automatically in 1/3-step increments; it can also be set manually from ISO 6 to 6,400 in 1/3-step increments. Film is loaded automatically and advanced to the first frame when the camera back is closed. You have the choice of single-frame or continuous shooting at approximately 2.5 frames per second; the film counter reveals frame number. The film is rewound automatically at the end of the roll, or after 36 exposures with a midroll rewind option. The Canon EOS Elan IIe uses any Canon EF mount lens. A 28-80mm zoom lens is included with this model. Also comes with Canon strap. 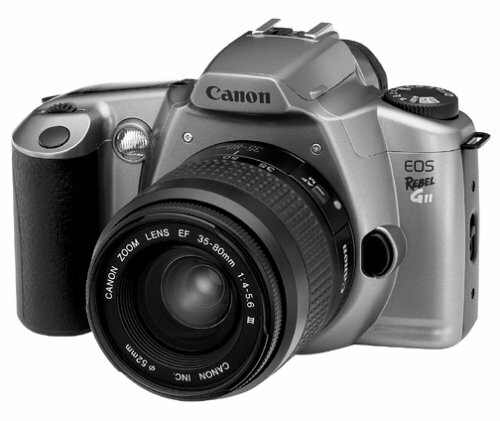 With easy-to-understand key controls and command dial, the Canon EOS Elan IIe offers advanced SLR features. It has automatic exposure control for any light conditions and a built-in flash that lets you shoot indoors or out, day or night. The Canon EOS Elan IIe is fully automatic, but lets you control the essentials manually. It offers nine different programmable exposures and a 10- second-delay self-timer. It is slightly different than the EOS Elan II in that it features eye-controlled focus. This allows the user to control the point of focus by looking at specific parts of the image; an on-board sensor follows eye movement and the lens automatically changes focus as the eye moves to points within the frame. This model features an LCD screen showing exposure information and LED readouts showing custom functions. The viewfinder provides all the information you need to set up your shots, including depth of field, flash, shutter speed and aperture, and much more. The EOS Elan IIe allows for film speeds from ISO 25 to 5,000. The speed is set automatically in 1/3-step increments; it can also be set manually from ISO 6 to 6,400 in 1/3-step increments. Film is loaded automatically and advanced to the first frame when the camera back is closed. You have the choice of single-frame or continuous shooting at approximately 2.5 frames per second; the film counter reveals frame number. The film is rewound automatically at the end of the roll, or after 36 exposures with a midroll rewind option. 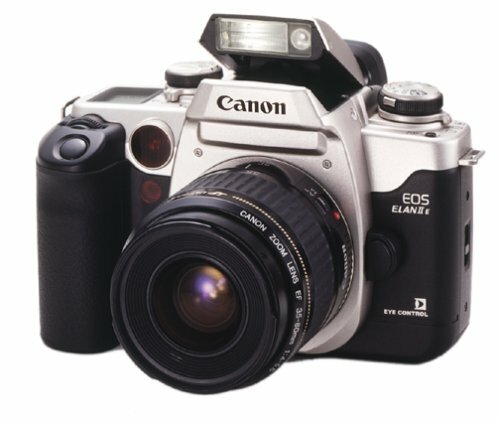 The Canon EOS Elan IIe uses any Canon EF lens. A 28-80mm zoom lens is included with this model. 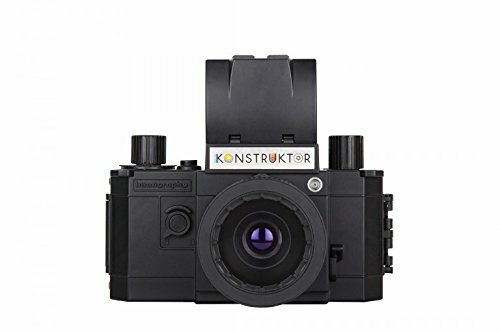 This Lomography Konstructor F is ideal for Do-It-Yourself lovers and those interested in learning, understanding and experiencing how analogue photography works, the Konstruktor F is a fully functional 35mm SLR camera that you can easily build at home. This hands-on camera also has PC socket so you can use flash accessories to shoot show stopping flash photos. You ll learn the essence of photography and be able to shoot wonderfully sharp and vibrant analogue photos. It s time to take the next step on your exciting photographic adventure. 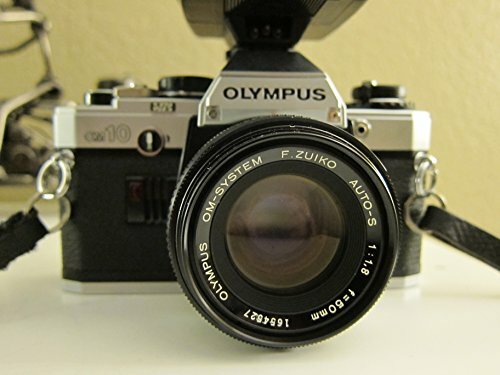 This Olympus OM 10 SLR 35mm film camera comes with a Zuiko 50mm f/1.8 prime lens, UV filter and fresh batteries. VSSoutlet tests and inspects every item that we sell. This camera has some very minor scuff marks and that are mainly on the bottom of the camera body. The lens has a few dust specks inside of it. There is no fungus, haze or separation to the glass and there is no oil on the aperture blades. The Canon Elan 7 E features the eye-controlled focus system, the fastest means of focusing and metering a photographer can find. By using more focusing points and greater off-center coverage than other cameras in its class, this camera is able to take an exact reading in approximately 1/20 of a second. When the photographer brings the camera to their eye, their glance is tracked by the focusing system, allowing framing and focusing to become a single uninterrupted creative process. An easy, one-time calibration is all that's needed to activate the eye-controlled focus system. Once this calibration is complete, the camera is able to precisely detect which part of the viewfinder the photographer is using. It then automatically focuses the lens with amazing accuracy. This system delivers crisp, sharply focused images whether the camera is in a vertical or horizontal position. The Canon Elan 7 is even able to store the distinct calibrations of up to five different photographers. Using an EF 300mm f/2.8 IS lens, it can track a subject moving at 186 mph until it's a mere 66 feet from the camera. This fast-focus system, combined with the ability to shoot at almost 4 frames per second, makes the Canon Elan 7 the perfect choice for capturing those demanding sporting events or special occasions when you don't want to miss a single moment. And, considering its continuous shooting speed, the Elan 7 is also remarkably quiet. This feature gives the photographer the opportunity to shoot the perfect wildlife scene without disturbing or scaring the subject. Part of the Elan 7's focusing system is the seven-point wide-area autofocus. The eye-controlled focus system was designed to work especially with this precision feature. Seven focusing points are arranged in a wide cross pattern with a central "cross-type" sensor. The wider-than-usual area gives the photographer the ability to achieve a remarkably sharp, focused image instantly. This function works whether the subject is off-center, stationary, in motion, in low light, or even in low-contrast situations. The shot will still come out sharp and crisp, and without the need to recompose the shot. By using the focusing-point selection keys, the user is able to select any of the seven focus points simply by pressing a key. Representing a bold innovation in speed and usability, this feature gives an additional amount of image control back to the photographer. A highly advanced metering system, comprised of 35-zone evaluative metering sensors, is linked to the seven focusing points. Whether shooting indoors or outside, day or night, a seamless integration of exposure and focus ensures remarkable clarity and contrast in any image. This system gives the photographer accurate control over situations that combine light and shadow or that feature strong backlight. When metering subjects against very dark or very bright backgrounds, partial-area metering measures 10 percent of the viewfinder around the chosen focusing point. This provides accurate image results when dealing with shadows or highlights. The photographer can also use the Elan 7's center-weighed metering function. This mode places greater emphasis on what it reads as the center of the frame by measuring the entire scene. No matter which function the photographer chooses, precision metering is guaranteed--whether the camera is in a vertical or horizontal position. Giving the photographer even more creative control is the command dial. This allows manual control light, speed, aperture, and depth of field. Shutter priority lets the photographer choose the shutter speed while the Elan 7 automatically selects the correct aperture. This function is especially useful when capturing action shots. With aperture priority, the photographer picks the aperture setting while the camera chooses the correct shutter speed. This is helpful when control over the depth of field is essential. Using the eye-controlled focus system to define the "sharp zone," the photographer can calculate the precise depth of field automatically. It's even possible to check the depth of field using the preview button. Proved to be a trend setting camera with its simple, friendly and no frills design. Three basic exposure control modes in Program AE ("P"), Aperture Priority AE ("A") and Manual exposure control modes. Further, TTL OTF flash exposure control was also featured when artificial illumination is required. In particular with the Minolta X-700's Minolta Program System (MPS), it provides a simple focus-and-shoot simplicity of programmed auto-exposure (AE) control: where both aperture and shutter speed are automatically set over a wide range by the camera, with continuous viewfinder LED readout of speeds being set. The program is designed to maintain fastest practicable speeds as light dims, then give audible beeps, if desired, to guard against blur from subject/camera-movement, making the X-700 ideal if you're starting out in photography or if you want full program automation for ease of use or fast-breaking action. Although Program AE has been made available in some other cameras, but it took a X-700 to realize its potential to be a decisive marketing elements in SLR cameras as compared to sheer convenience of P&S cameras. STUDENT CAMERA PACKAGE, MANUAL, BELL AND HOWELL CAMERA, W 2 LENSES. SHUTTER WORKS ON ALL SPEEDS. VERY CLEAN INSIDE. ONLY VERY MINIMAL LIGHT WEAR. CANON 50MM 1.8 LENS. 713600. NO HAZE. NO FUNGUS. NO SCRATCHES. NO DUST. VIVITAR 85-205MM 3.8 LENS. 22645094. NO HAZE. NO FUNGUS. NO SCRATCHES. NO DUST. IN GREAT CONDITION. 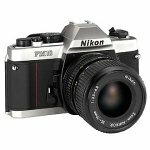 Minolta 110 Zoom SLR is a 110 format single lens reflex camera. It has an unusual, flattened shape. It took the flat format of the typical 110 pocket camera and added a larger lens and prism to it. 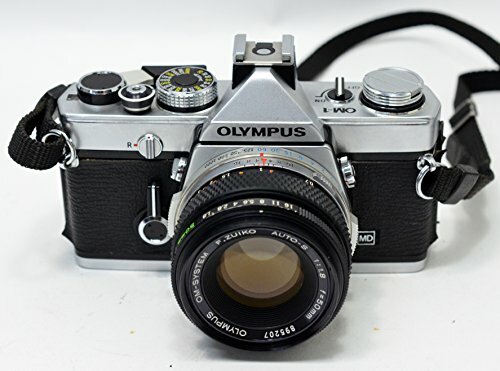 The 110 Zoom SLR provided aperture priority automatic exposure, Light metering was with a CdS meter mounted on the front of the camera. An exposure compensation dial allowed the photographer to compensate for unusual lighting situations and allows using film speeds other than the ISO 100 or 400 auto selected by the cartridge tab, by applying the appropriate compensation factor. 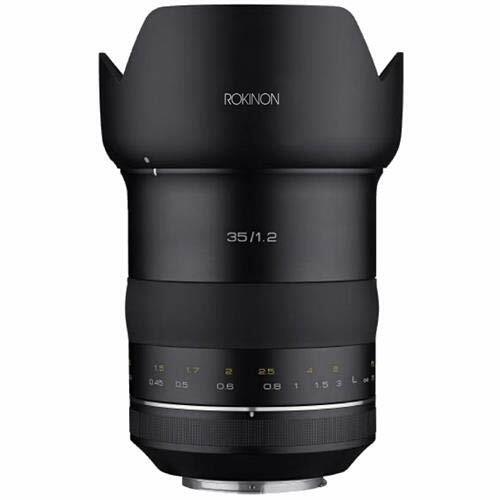 The lens was a fixed 25-50 mm f/4.5-16 manual focus zoom with macro focusing down to 11 inches. This gave a field of view range approximately equivalent to a 50-100 mm zoom lens on a 35 mm format camera. The filter thread diameter is 40.5mm. Available shutter speeds were 1/1000 second through 10 seconds, with a 1/150 second X-sync speed and support for bulb exposure. There was no built-in flash, but a hot shoe on the top allowed an external flash to be used.